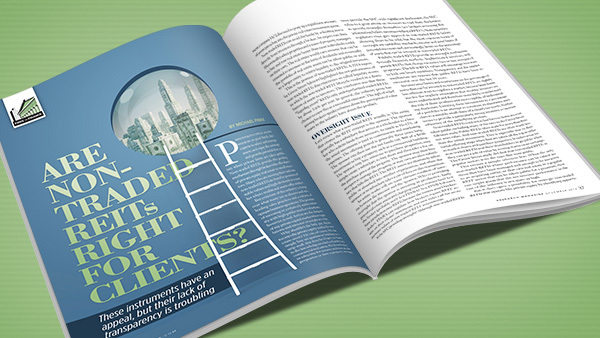 Are Nontraded REITs Right for Clients? These instruments have an appeal, but their lack of transparency is troubling, Michael Finke writes. Criticism of the REIT industry is rising over what many see as abusive and misleading sales practices. Private equity capital allows investors to pool funds, hire experts to select and manage assets, and enjoy the earnings and growth potential that exists when private firms are taken public. Nontraded REITs provide this pooling mechanism through brokers who offer shares of private equity real estate to small investors. Many who are moving their cash into nontraded REITs are lured by promises of stable values and high dividends in a market where traditional assets offer neither. But criticism of the industry is rising over what many see as abusive and misleading sales practices and a culture of opaque business operations. The promise of investing in a relatively stable industry with high public market valuations, however, is real. And so are the dangers of any private capital market where regulations and investor oversight are thin. Why shouldn’t the little guy dip his toe into the private equity market for real estate assets? He can, of course. He can simply buy an apartment building or a strip mall. But then he’d have to invest in the knowledge needed to find the best commercial real estate. He’d need either to advertise for tenants and manage the properties or hire a property management company. He’d also need to pony up a significant amount of assets just to buy into the private real estate investment game. Nontraded REITs can avoid the hassle by soliciting assets directly from investors through a broker. An expert can then (theoretically) select properties and a team of property managers to buy and rent real estate better than most individuals could on their own. The real estate would earn income that can be returned to investors in the form of dividends and eventually the portfolio of real estate assets can be taken public or sold to a larger entity to return liquidity to the original investors. This is the promise of nontraded REITs. A 2014 report by Green Street Advisors highlighted the net performance of nontraded REITs that experience so-called liquidity events in which the nontraded REIT lifecycle resulted in a distribution of assets to investors. The conclusion was that these “liquidity event” REITs only underperformed traded REITs by about 3.6% per year. In general, the industry press has chosen to view this as a successful outcome. The sigh of relief among brokers speaks volumes about the perception of value many in the industry have about the product. Let’s review what a nontraded REIT actually is. The entity that creates the REIT concept is the sponsor. The sponsor generally has a subsidiary that serves as a wholesaler to a broker who solicits funds from investors. As much as 10–12% of the initial investment is paid in commissions and marketing expenses. The offering period is generally three years long. The sponsor can then use the net funds (say $88 of a $100 investment) to buy a property such as a commercial building. The sponsor may hire someone to purchase properties, may simply create a subsidiary to buy them and then take a fee on the purchase price of the property. The sponsor may then hire an expert to manage the property, or may own another subsidiary that bills the REIT. The REIT assets are ultimately taken public or absorbed into another organization, and often the sponsor or its subsidiary takes a cut of fees on this transaction. An astute reader will see some obvious conflicts of interest between the investor and the sponsor. Who is providing oversight that the sponsor is investing in productive, fairly priced real estate assets and charging market-correct fees? Is it the broker (probably not)? Is it FINRA? No, FINRA doesn’t have jurisdiction over REITs because the issuers aren’t broker-dealers. FINRA can regulate how brokers report REIT assets on their clients’ statements, and new rules call for more accurate values of nontraded REIT investments. Is the SEC providing oversight? Although nontraded REITs must provide the SEC with significant disclosures, the SEC relies to a great extent on investors to read these disclosures to provide oversight themselves (are brokers reviewing this information before recommending a REIT?). State securities regulators must give approval to nontraded REITs before allowing them to be sold, but the most common forms of oversight are suitability standards, income and asset limits of potential investors and, increasingly, limits on the percentage of assets that can be invested in nontraded REITs. Publicly traded REITs provide an oversight mechanism through financial markets. Sophisticated investors will punish REITs that charge excessive fees or buy overpriced properties. The fall in REIT values will encourage investors to kick out board members. Transparency and the market mechanism are reasons that public REITs have been so successful over the last 30 years. Income/asset limits and restrictions on the percentage of assets that can be invested in nontraded REITs are slightly less efficient ways to regulate a market. Income/asset limits involve the implicit assumption that wealthy investors are more sophisticated and therefore more likely to understand the risk of these products and more capable of understanding disclosure. Limiting these investments to a percentage of a portfolio is an attempt to constrain an alternative asset class to a suitably small share of a client’s net worth. Neither seems to provide a particularly strong incentive to increase efficiency of the underlying product. Nontraded REITs tend not to last forever. Some are even taken public, including many of the ones in the Green Street Advisors study. Public REITs often trade for more than their net asset value. And nontraded REITs are often worth less than the initial investment. This is especially true in their initial offering stage when fees are taken off the top in order to market shares and purchase properties. It makes sense for nontraded REITs and their shareholders to go public when they can get a jolt of value by issuing shares on an exchange. The Green Street study did find that nontraded REITs in popular sectors were the ones that went public. This creates a sample selection bias. When the only nontraded REITs whose performance can be valued are those that have been managed well enough to be attractive to an acquiring entity, or that own real estate in a popular REIT sector that can be taken public for a premium, then one might guess that the net investor performance in the rest of the industry is not quite as high. But it does open a possibility for strategic nontraded REITs that operate like private equity by identifying opportunities where the public valuation exceeds the private valuation. For example, if senior housing is seen as a growth sector before boomers start retiring, then an entrepreneur could solicit funds to purchase assisted living facilities. After the properties are purchased with seed capital from investors, the new senior housing REIT could be taken public and all of the million dollar properties would now be worth $1.5 million on an exchange. Unlisted REIT investors cash out and everyone wins. This story explains when an unlisted REIT makes sense. The darker side is that these products contain many opportunities for sponsors to take advantage of the lack of transparency that exists within the industry. High commissions erode shareholder value. Lack of management oversight can lead to excessive fees and the purchase of property for which there are frightening conflicts of interest. There is an abundance of horror stories of nontraded REITs gone bad in which dividends have been sliced, property values have plummeted either from bad markets or abuse, and investors are left with no ability to sell even their nearly worthless shares. If you’re an advisor, how are you going to feel when a retiree asks what happened to the safe, reliable dividend machine you sold them? In a 2012 report, Green Street Advisors noted that the industry appears to be split between two types of nontraded REITs. One pays very high commissions and charges high management fees and is opaque about actions that erode investor value. The other charges competitive fees and is more transparent about operations. The less transparent products are often sold to unsophisticated buyers on the promise of income and stability. The more transparent products are marketed to sophisticated investors and institutions. Some REIT veterans are upset at nontraded REITs for using the positive public perception of REITs built up over the last 30 years to increase the appeal of products that are fundamentally more about capturing excess cash from unwary investors than they are about providing value. Green Street Advisors co-founder Jon Fosheim explained in the Spring 2012 Wharton Real Estate Review that unscrupulous entrepreneurs who took advantage of the syndicated limited real estate partnerships in the 1980s may see nontraded REITs as an opportunity to resurrect a flawed and abusive product that benefits from the trust that investors have in publicly-traded REITs. To Fosheim, sponsors may view nontraded REITs as a way to “charge outrageous fees, have plenty of conflicts that we can exploit, and no one will know the difference because we won’t list on an exchange.” Ouch. As public REIT yields have fallen to around 4%, investors hoping for more income will be drawn to promises of a much higher dividend payment from nontraded REITs—particularly retirees funding a spending goal from an investment portfolio. A problem with these promised dividend payments is that they are often covered by selling (or simply reallocating) capital. If this sounds a little like a Ponzi scheme, there is a reason. Since the offering period lasts three years and the liquidity event happens seven to 10 years afterward, there would be no incentive to buy shares until the end of the offering period if dividends weren’t paid. Since everyone would wait, there would be no early investors without the return of capital to pay early dividends. New FINRA rules require greater disclosure of appraised share values on investors’ account statements 18 months after the offering period. If the original investment was $100,000 and marketing expenses were $12,000, then the value of the nontraded REIT shows up as $88,000. If dividends got paid from investment capital and a few percent was paid on expenses to acquire the real estate, then the amount could be even lower. The FINRA rule requires that values of real estate assets be estimated by a third-party appraiser using industry standards. The ability to report the value of the nontraded REIT at the original $100,000 made the investment seem artificially stable and didn’t provide enough of an incentive to reduce costs. The theory is that when clients see a drop in value, they’ll ask questions. Finke: Is the Time Right for REITs?